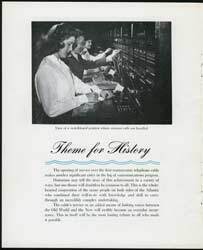 Introduction: The 1956 opening of the first transatlantic telephone cable system, TAT-1, marked the beginning of the modern era of cable communications. The more technical aspects of the cable project are covered on other pages; this section records the details of the opening ceremony. One highlight here is this MP3 audio file of part of the first official telephone call over TAT-1, which includes a conversation among representatives of the three communications authorities responsible for the cable (7 minutes, 1.8MB). 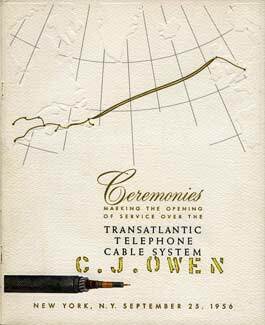 See also this page on the contribution of Standard Telephones & Cables (STC) to TAT-1. The cable was available for traffic immediately after the opening ceremony, and this article provides an analysis of the volume of calls over the next four weeks. Transatlantic Telephone Cable System 1 (TAT-1) was inaugurated on 25 September 1956 with a three-way telephone conversation between New York, Ottawa, and London. Many distinguished guests participated in this first official call over the new circuit, the first Atlantic cable of its generation. In Ottawa were Douglas F. Bowie, President of the Canadian Overseas Telecommunications Corporation; T.W. Edie, President of the Bell Telephone Company; Livingston T. Merchant, U.S. Ambassador to Canada; Mr. Neil Pritchard, the Deputy United Kingdom High Commissioner to Canada; and the honourable George C. Marler, the Minister of Transport for Canada. 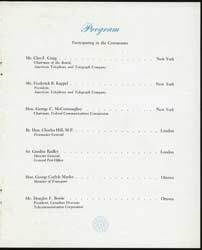 This program for the New York portion of the opening ceremony was evidently presented to C.J. Owen, an employee of AT&T’s Long Lines division. 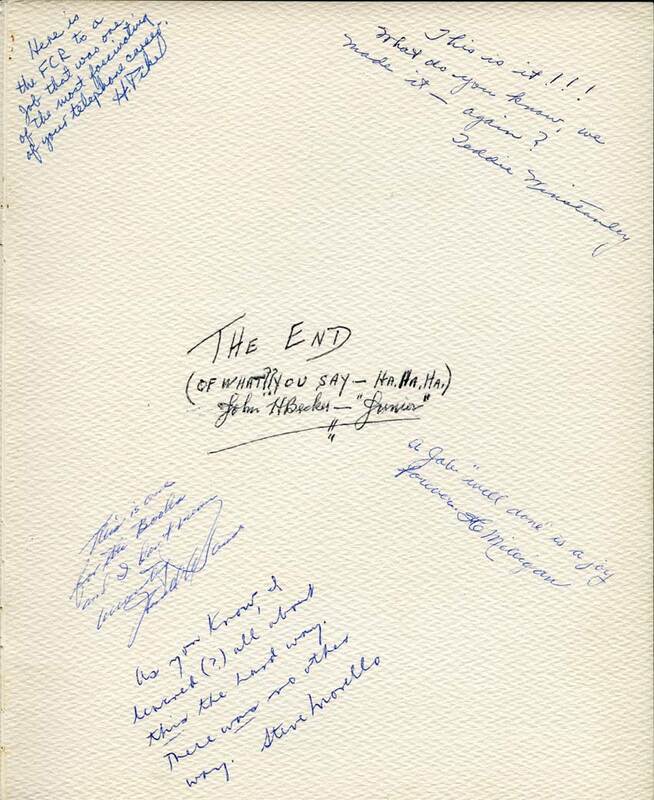 Inside the back cover are dedications from some of his colleagues commemorating the end of the project, and bound in are three carbon copy pages with financial details of the cable; these are from the Completion Report of TAT-1 and are dated November 1958. 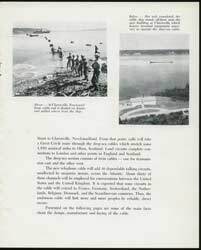 The program provides some interesting information on the construction and laying of the cable. Rt. Hon. Charles Hill, M.P. Spanning the Atlantic has challenged mankind since the days of the Norsemen. Over the years such crossings have become frequent and taken various forms. 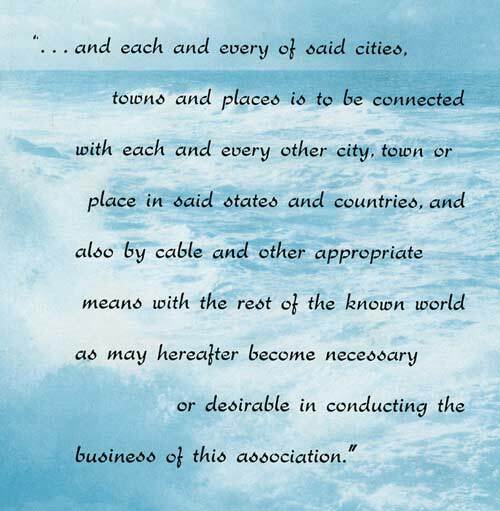 In communications, for example, Cyrus Field conquered the ocean with his telegraph cable in 1858. Marconi transmitted successfully the first radio signal from shore to shore in 1901. In 1915 voices sent by radio from Arlington, Va., were heard in Paris. And in 1927, the year of Lindbergh’s superb flight, radio­telephone service was introduced between the United States and England. Since then the scope and volume of international telephone service have steadily grown. In anticipation of today’s greater demand, scientists and engineers as early as the 1920’s recognized the need for an under-ocean telephone cable that would make conversation across the sea more reliable. But the odds were tremendous. Amplifiers, fed by power from distant shores and capable of long life, would have to be laid at frequent intervals on the ocean floor. Such devices did not even exist. 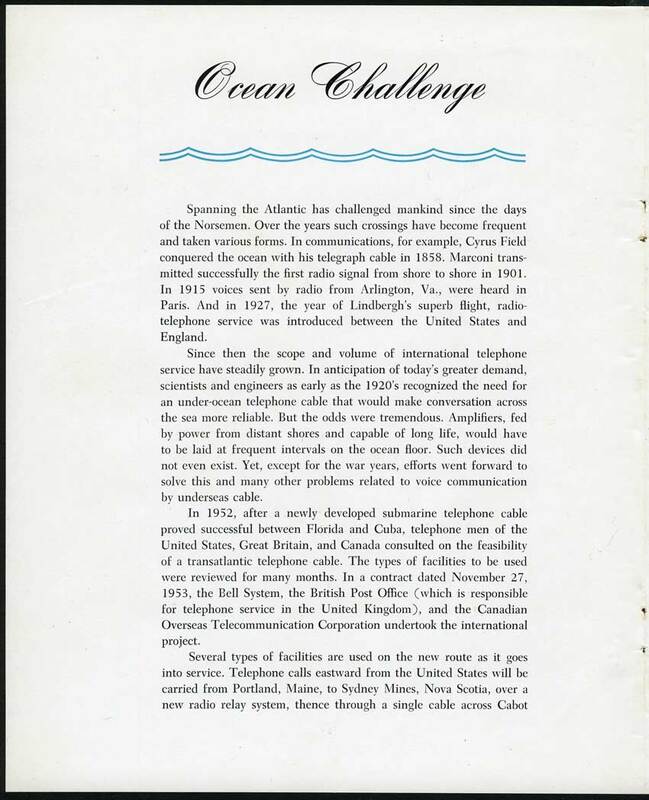 Yet, except for the war years, efforts went forward to solve this and many other problems related to voice communication by underseas cable. In 1952, after a newly developed submarine telephone cable proved successful between Florida and Cuba, telephone men of the United States, Great Britain, and Canada consulted on the feasibility of a transatlantic telephone cable. The types of facilities to be used were reviewed for many months. In a contract dated November 27, 1953, the Bell System, the British Post Office (which is responsible for telephone service in the United Kingdom), and the Canadian Overseas Telecommunication Corporation undertook the international project. Several types of facilities are used on the new route as it goes into service. Telephone calls eastward from the United States will be carried from Portland, Maine, to Sydney Mines, Nova Scotia, over a new radio relay system, thence through a single cable across Cabot Strait to Clarenville, Newfoundland. 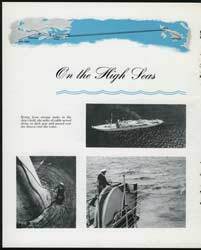 From that point, calls will take a Great Circle route through the deep-sea cables which stretch some 1,950 nautical miles to Oban, Scotland. Land circuits complete connections to London and other points in England and Scotland. 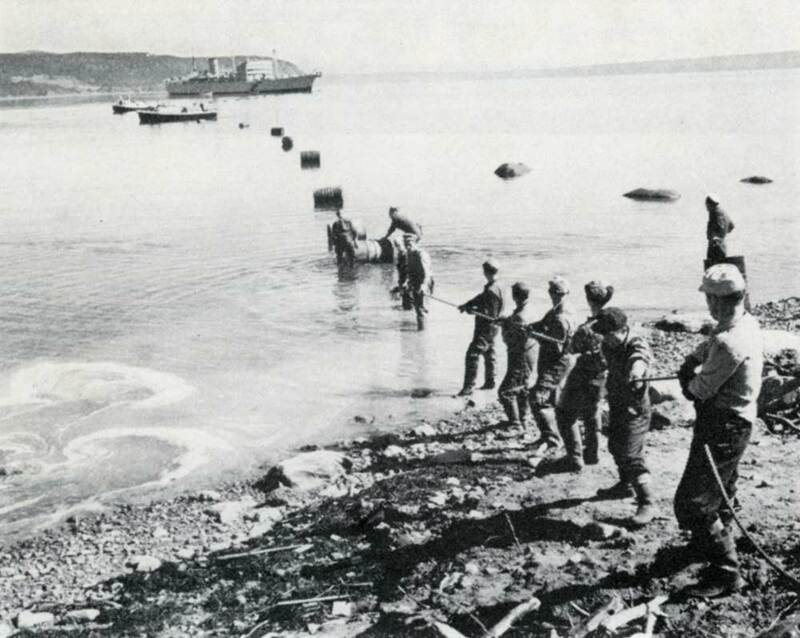 At Clarenville, Newfoundland, cable end is floated on drums and pulled ashore from the ship. 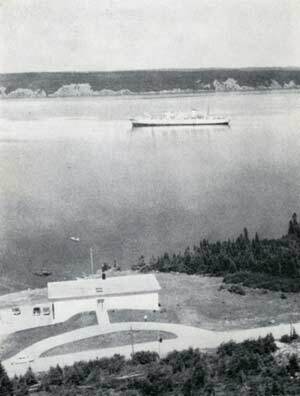 Her task completed, the cable ship stands offshore near the new building at Clarenville which houses terminal equipment necessary to operate the deep-sea cable. 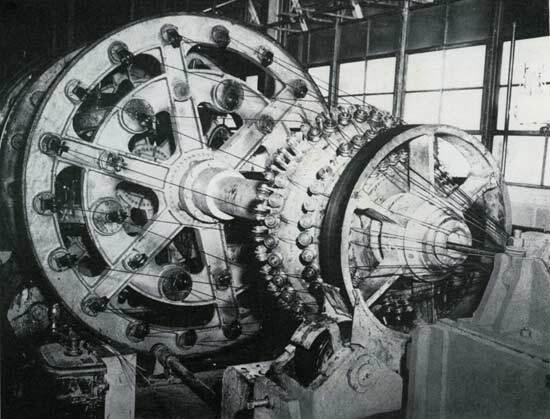 The deep-sea section consists of twin cables — one for transmission east and the other west. The new telephone cable will add 36 dependable talking circuits, unaffected by magnetic storms, across the Atlantic. About thirty of these channels will be employed for conversations between the United States and the United Kingdom. It is expected that some circuits in the cable will extend to France, Germany, Switzerland, the Netherlands, Belgium, Denmark, and the Scandinavian countries. 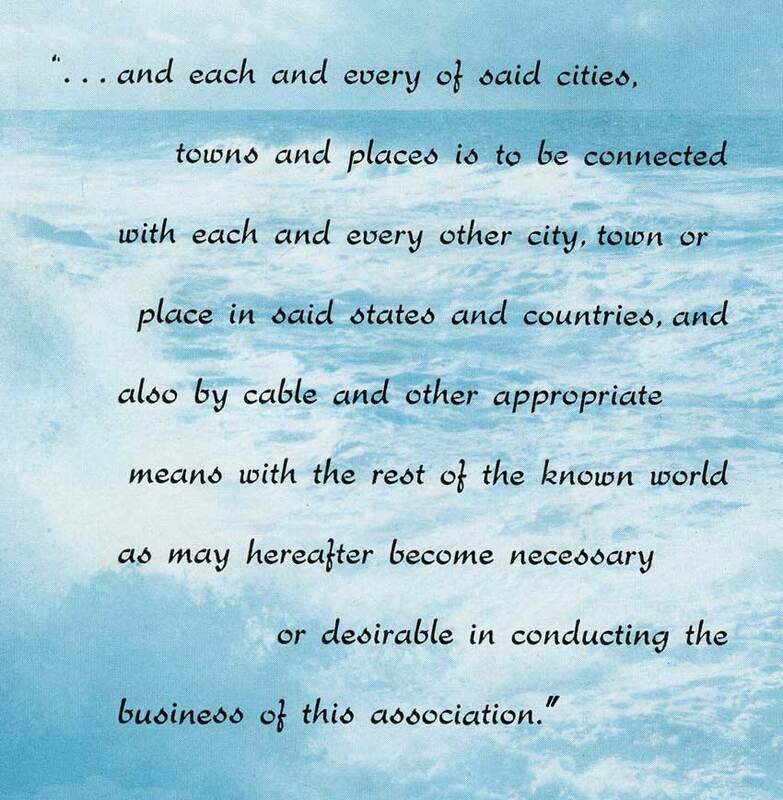 Thus, the underseas cable will link more and more peoples by reliable, direct means. 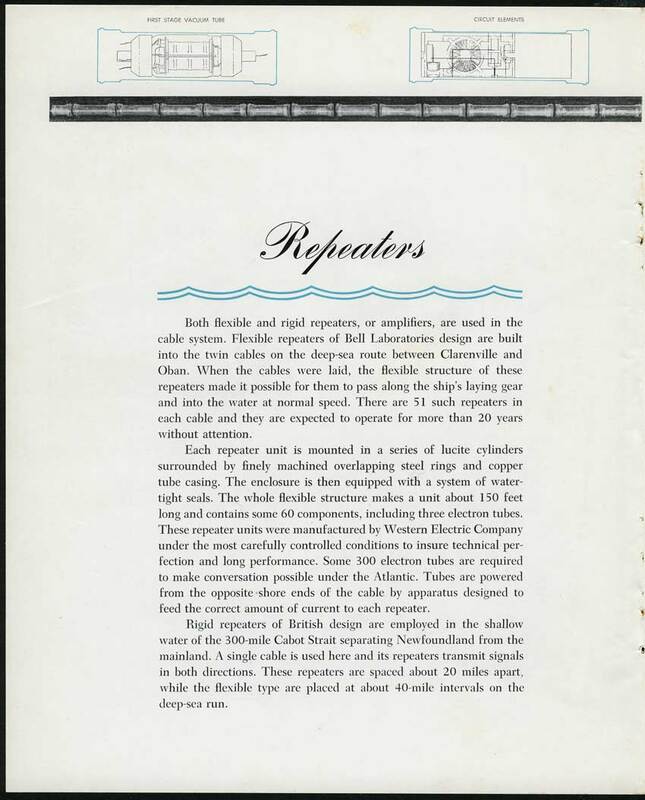 Presented on the following pages are some of the main facts about the design, manufacture and laying of the cable. Both flexible and rigid repeaters, or amplifiers, are used in the cable system. Flexible repeaters of Bell Laboratories design are built into the twin cables on the deep-sea route between Clarenville and Oban. 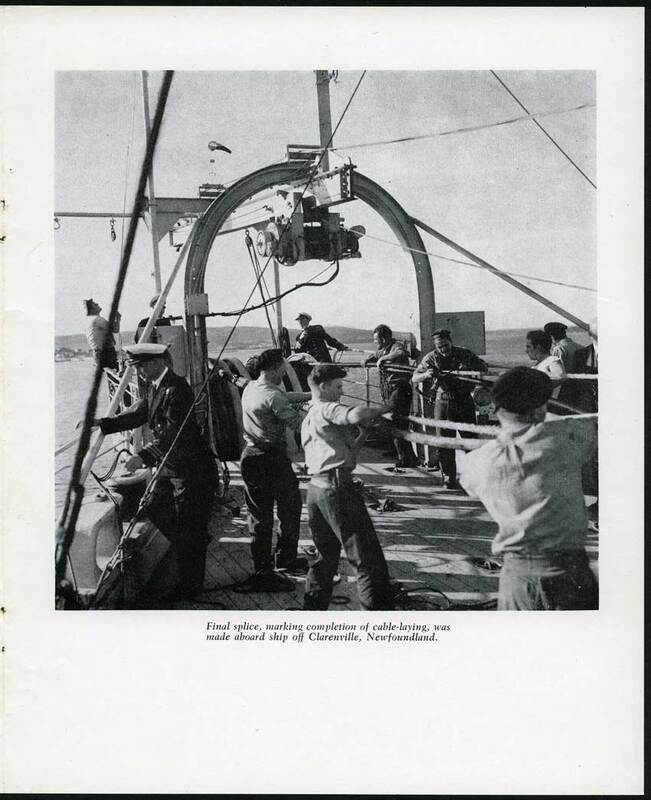 When the cables were laid, the flexible structure of these repeaters made it possible for them to pass along the ship’s laying gear and into the water at normal speed. There are 51 such repeaters in each cable and they are expected to operate for more than 20 years without attention. Each repeater unit is mounted in a series of lucite cylinders surrounded by finely machined overlapping steel rings and copper tube casing. The enclosure is then equipped with a system of watertight seals. The whole flexible structure makes a unit about 150 feet long and contains some 60 components, including three electron tubes. These repeater units were manufactured by Western Electric Company under the most carefully controlled conditions to insure technical perfection and long performance. Some 300 electron tubes are required to make conversation possible under the Atlantic. Tubes are powered from the opposite shore ends of the cable by apparatus designed to feed the correct amount of current to each repeater. In the flexible-type deep-sea repeater each of the seventeen Lucite cylinders contains a variety of special components, as indicated in the cross-section views of two units. Rigid repeaters of British design are employed in the shallow water of the 300-mile Cabot Strait separating Newfoundland from the mainland. A single cable is used here and its repeaters transmit signals in both directions. These repeaters are spaced about 20 miles apart, while the flexible type are placed at about 40-mile intervals on the deep-sea run. 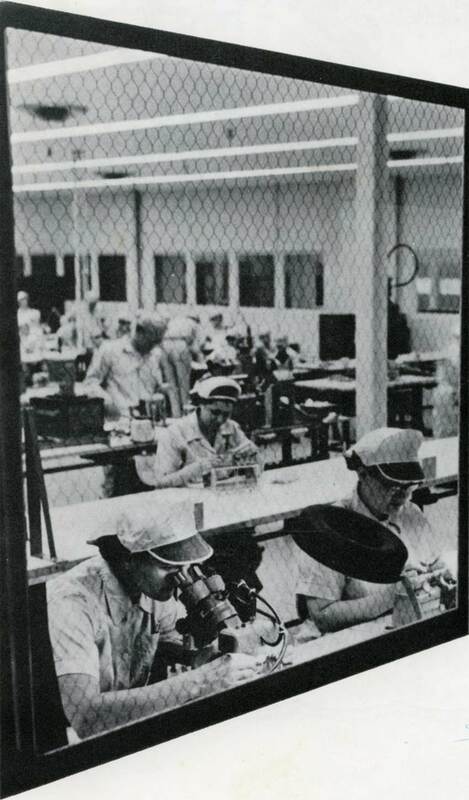 Repeater production was carried on in dust-free workrooms where humidity and temperature were as carefully controlled as in the operating room of a hospital. In the manufacture of many repeater parts, microscopic checking of every step was necessary. On the processing line the cable moved along to receive various coverings, including heavy steel wires whirled on by an armoring machine. 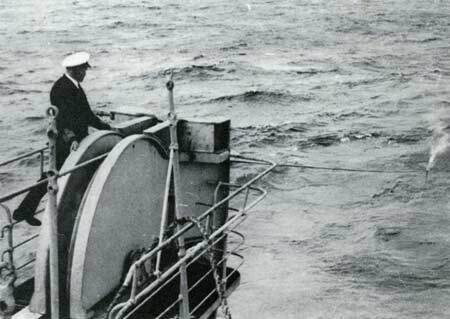 The pair of cables laid under the North Atlantic to depths of as much as two and one-half miles represent a tremendous forward step in cable design and manufacture. The central conductor is enclosed in a layer of plastic insulation, spiraling copper return tapes and then covered with a series of protective tapes of several types. 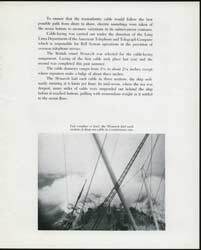 The whole is then armored, the amount of steel depending on the location of the cable beneath the ocean depths --- heavier armoring being placed where the cable might be damaged by ice floes, ships’ anchors, trawler fishing, and similar hazards. Manufacturing organizations on both sides of the Atlantic made the cable with the aid of new and ingenious equipment which would meet the remarkably close tolerances required. 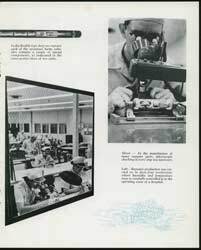 British and American teams worked for months to combine the latest manufacturing techniques with years of experience in cable-making. 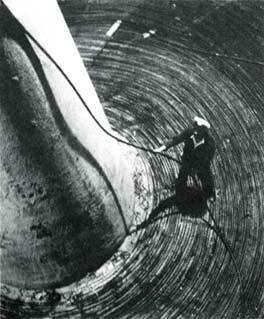 Rising from storage tanks in the ship’s hold, the miles of cable moved along on deck gear and passed over the sheaves into the water. 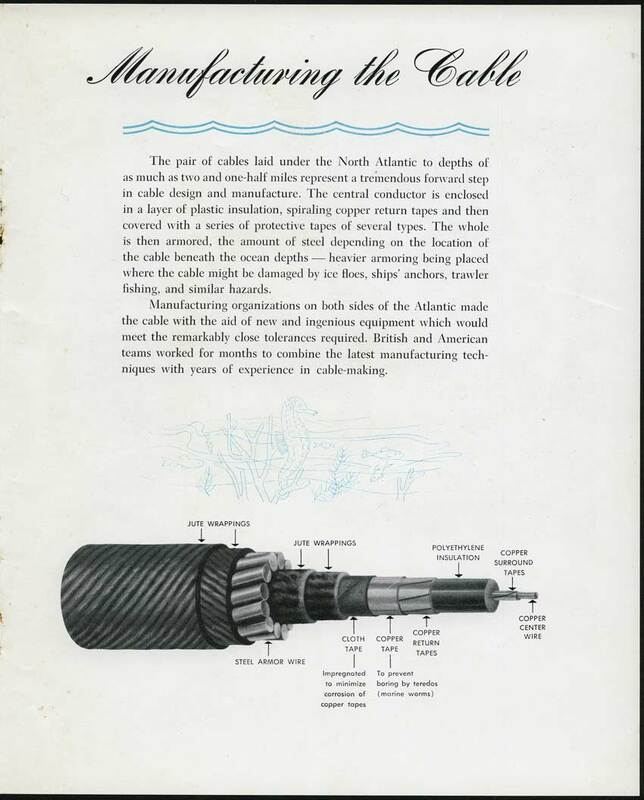 To ensure that the transatlantic cable would follow the best possible path from shore to shore, electric soundings were taken of the ocean bottom to measure variations in its subterranean contours. 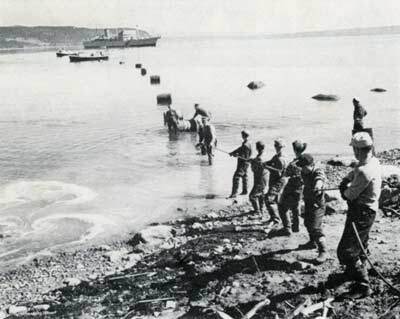 Cable-laying was carried out under the direction of the Long Lines Department of the American Telephone and Telegraph Company which is responsible for Bell System operations in the provision of overseas telephone service. The British vessel Monarch was selected for the cable-laying assignment. Laying of the first cable took place last year and the second was completed this past summer. The cable diameter ranges from 1¼ to about 2¼ inches, except where repeaters make a bulge of about three inches. 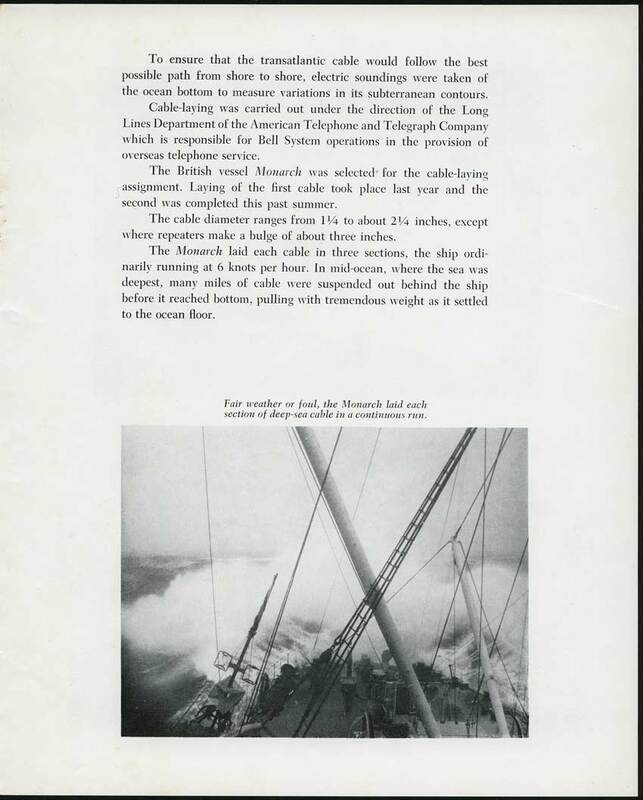 The Monarch laid each cable in three sections, the ship ordinarily running at 6 knots per hour. 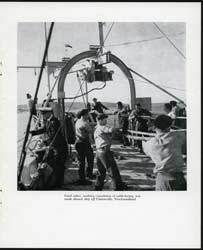 In mid-ocean, where the sea was deepest, many miles of cable were suspended out behind the ship before it reached bottom, pulling with tremendous weight as it settled to the ocean floor. 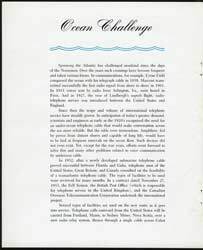 of deep-sea cable in a continuous run. 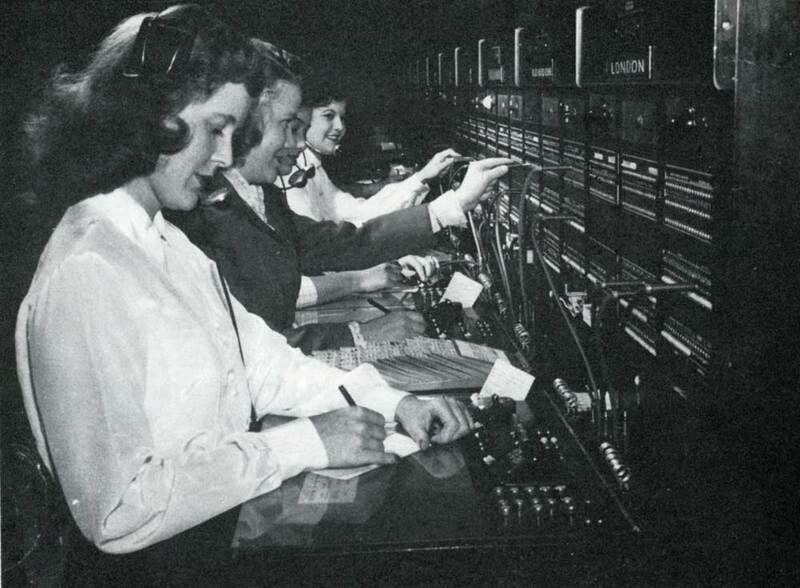 View of a switchboard position where overseas calls are handled. 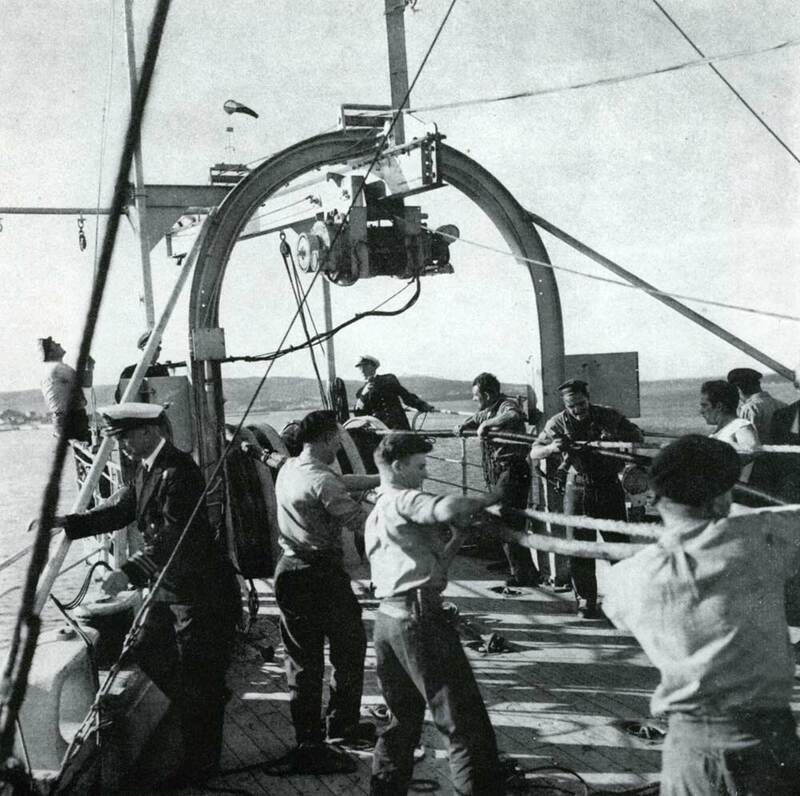 The opening of service over the first transoceanic telephone cable makes another significant entry in the log of communications progress. Historians may tell the story of this achievement in a variety of ways, but one theme will doubtless be common to all. This is the whole­hearted cooperation of the many people on both sides of the Atlantic who combined their Will-to-do with knowledge and skill to carry through an incredibly complex undertaking. The cable’s service as an added means of linking voices between the Old World and the New will swiftly become an everyday occurrence. This in itself will be the most lasting tribute to all who made it possible. was made aboard ship off Clarenville, Newfoundland. The electrical member of the present deep-water design is a coaxial cable consisting of a copper wire 0.1318 inch in diameter enveloped in a helix of three copper “surround” tapes 0.0145-inch thick. These tapes, evidence of the highly conservative nature of submarine cable art, are for continuity of the circuit in the event of a break in the solid center wire. The dielectric surrounding this composite central conductor is a 0.620-inch outer-diameter layer of polyethylene (of high molecular weight) compounded with five per cent, by weight, of butyl rubber plus a suitable anti-oxidant. The electrical path is completed by a helix of six copper “return” tapes 0.016-inch thick spiralled around the dielectric. Surrounding the electrical member are the protective and strengthening layers, most of which have remained substantially unchanged since their prototypes were introduced to submarine cable design in the middle of the last century. First is the teredo tape, an overlapped helix of 0.003-inch copper tape intended to prevent damage to the insulation by marine borers. Next is a cotton binder tape coated with butyl rubber, then a single layer of cached jute to serve as bedding for the high-tensile steel armor wires. Despite their names, the primary function of these wires is strength—for handling, laying, and possible recovery of the cable. Two layers of coal tar-impregnated jute over the armor wires complete the cable structure. Since there is little to impede ready access of seawater to the outer surface of the polyethylene dielectric, this structure comprises a “wet core” cable. 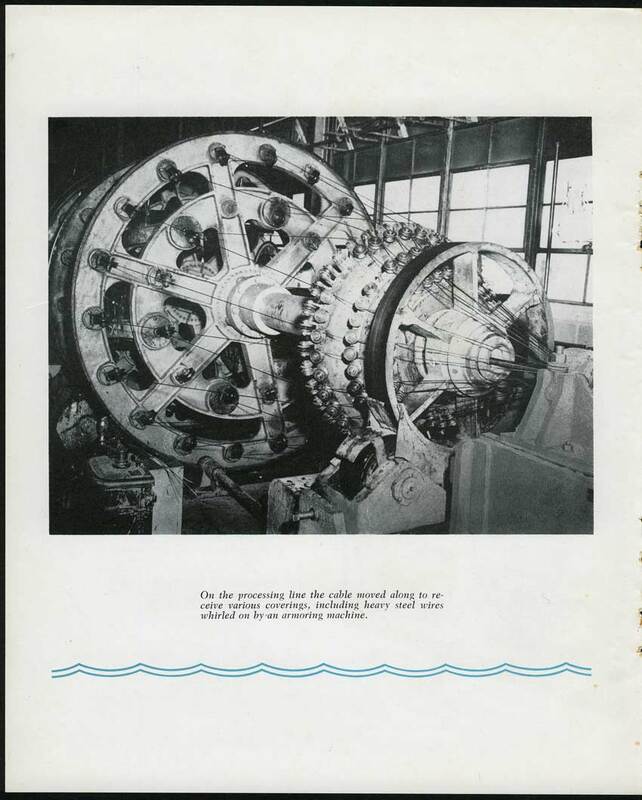 It is, in fact, kept in water continuously after the final stages of manufacture, except for brief periods while being transferred into and out of the holding tanks aboard the cable-laying ship. The opening ceremony was broadcast by Canadian radio station CFCF of Montreal from the banquet hall of the Chateau Laurier Hotel in Ottawa. The approximately 53-minute broadcast was recorded on a set of three transcription discs, of which two survive and are in the archives of the Atlantic Cable website. These include much of the three-way telephone conversation between London, Ottawa, and New York. 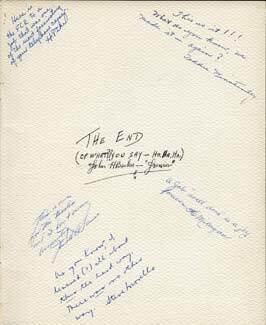 A full transcript of the available material is on this page, and an extract of the first phone call, including the official opening of the cable in each country, is transcribed below. You can also listen to an MP3 audio file of the first phone call (7 minutes, 1.8MB). 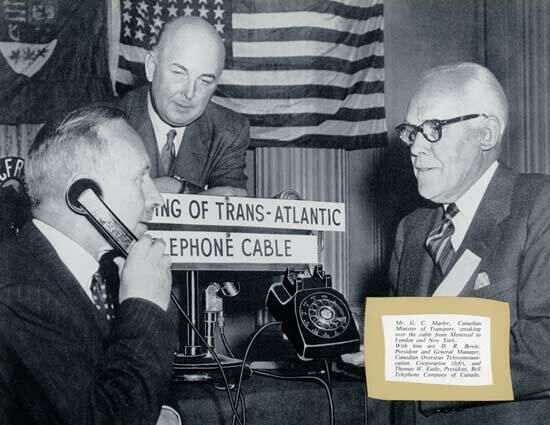 The inauguration of the first transatlantic telephone cable on September 25th, 1956. Mr. D.R. Bowie, President and General Manager of the Canadian Overseas Telecommunication Corporation, speaks at the three-nation hook-up which officially “opened” the cable service. The microphones are marked CFCF, CBC, and CFRA. (Bowie) May I have your attention, please. I think it would be desirable now if you would all pick up your handsets and be prepared for the conversations. (background voice) We’re in to London. (Craig) This is Cleo Craig in New York calling Dr Hill in London. Good afternoon. 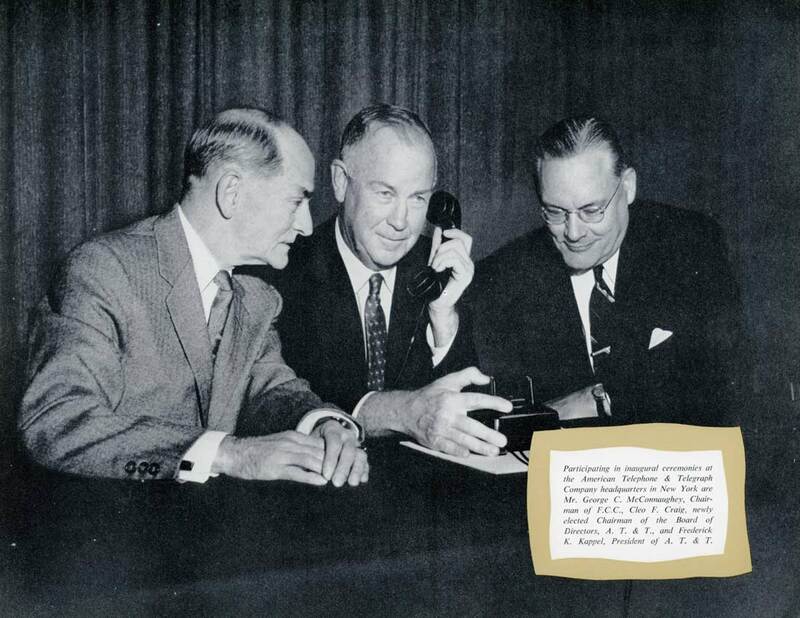 Participating in inaugural ceremonies at the American Telephone & Telegraph Company headquarters in New York are Mr. George C. McConnaughey, Chairman of FCC, Cleo F. Craig, newly elected Chairman of the Board of Directors, AT&T, and Frederick K. Kappel, President of AT&T. 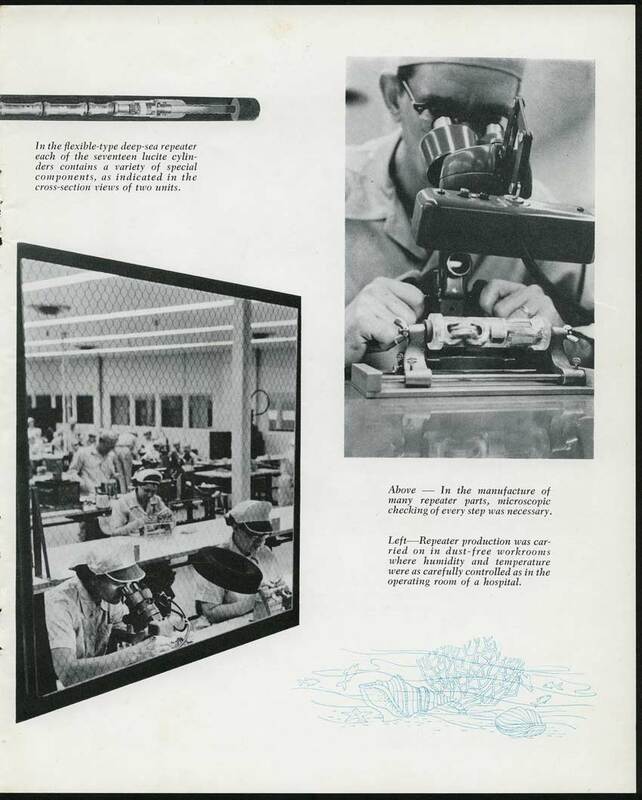 This and the following two photographs are from the STC publicity book for TAT-1, “The First Transatlantic Telephone System,” published in 1957. (Hill) Hello, Mr Craig, this is Dr Hill in London. Is that you, Mr Craig? (Craig) This is Mr Craig. (Hill) Well, it’s very good to hear your voice, and to join with you and our friends in Canada in inaugurating this, the first transatlantic telephone cable service. Well, Mr Craig, it’s been a great day for those who for years have dreamt and waited for this thing. Into it, as well you know, has gone the best from each country, and only the best was good enough. But it’s not too sentimental, I hope, to say that as the people of our three countries use this cable more and more, the ties of friendship and understanding between us will grow the stronger. The Postmaster-General the Rt. Hon. Dr. Charles Hill, MP. 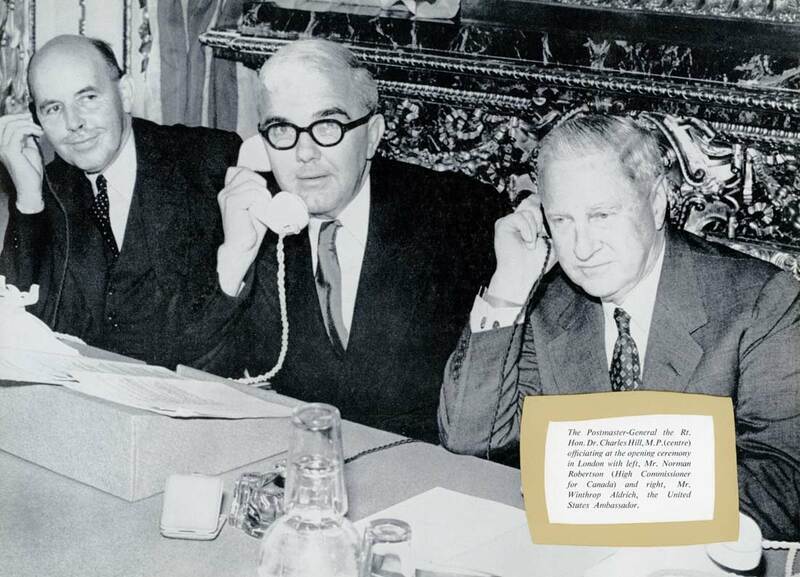 (centre) officiating at the opening ceremony in London with left, Mr. Norman Robertson (High Commissioner for Canada) and right, Mr. Winthrop Aldrich, the United States Ambassador. (Craig) We certainly share your feelings, Dr Hill. And it seems to me that the building of the cable, all the planning and all the work of construction, these things in themselves are another fine example of the good spirits and the cooperation which exists between our two countries. Now Mr McConnaughey, Chairman of our Federal Communications Commission is here, and would like to exchange a word with you, so goodbye for the moment. (McConnaughey) Hello, Dr Hill, this is Mr. McConnaughey. (Hill) Well how do you do, sir? It’s no exaggeration to say that you sound as if you’re speaking from somewhere in London. Yet you’re four thousand miles away as the circuit flies, or swims. Well, it’s very exciting to me, as I’m sure it is to you. (McConnaughey) It is indeed, sir. I’ve been looking forward to this event with the greatest of energy. You know, we expect great things of the people who provide communication services, and I think they’re today delivering great things, and I know you agree. We at the Federal Communications Commission feel that this cable is a major step forward in telephone progress, and I congratulate all who had a part in bringing it about. (Hill) Yes, and I agree. May I mention one name? We have here as everyone knows, a real triumph of patient research and engineering skill, and on behalf of all of us here in London I would like to pay tribute to Dr Buckley and all those in the United States, who, long before this became a project, had made it possible by their research and experiment. (McConnaughey) Thank you, Dr Hill, and now I will put Mr Craig on, as I know he would like to speak at this point. (Craig) Yes, Dr Hill, I just want to thank you for your splendid tribute to our people, and to say on our part how much we’ve enjoyed working with Sir Gordon Radley and his team. It’s been a real pleasure. (Hill) Thank you very much, Mr Craig. And now I’d like to speak direct to Mr Marler in Ottawa. Are you there, Mr Marler? (Marler) Yes, good morning, Dr Hill, for it’s still only a little past eleven o’clock in the morning here in Ottawa, while the afternoon is ending with you in London. This time difference emphasizes the great difference which separates us and the greatness of this achievement which makes our conversation so easy and so clear. 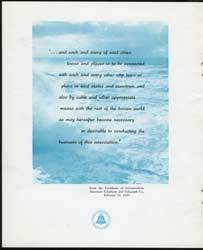 We in Canada are proud to be an associate in this great pioneer venture, and we join wholeheartedly in the praise which has been given to those whose research made it possible, those who so skilfully engineered it, and all who have cooperated in so many ways to win through to this success. Mr. G.C. Marler, Canadian Minister of Transport, speaking over the cable from Montreal* to London and New York. With him are D.R. Bowie, President and General Manager, Canadian Overseas Telecommunication Corporation (left), and Thomas W. Eadie, President, Bell Telephone Company of Canada. [*Note: While the photo caption gibes the location as Montreal, from the dialogue of the call the Canadian officials are quite clearly in Ottawa. The opening ceremony program above also has Ottawa. (Hill) Well, fine sentiments, Mr Marler, with which we warmly agree. Although we are separated by the depths of the Atlantic, our cable brings your voice to me as clearly as if you were here in Britain. And through you, Mr Marler, I want to send greetings and good wishes from the British team to those in Canada with whom they worked in such great harmony. And may I say how pleased I am to speak to you, Mr Marler, through this great new medium. (Marler) Thank you, Dr Hill. And now I would like to speak to Mr Craig in New York. Hello, Mr Craig. (Craig) Good morning, sir, it’s a great pleasure to talk with you. And we’ve been listening with interest to your conversation with London. (Marler) It has been indeed a wonderful experience, and I believe that this is an event that none of us is ever likely to forget. (Craig) That’s right. 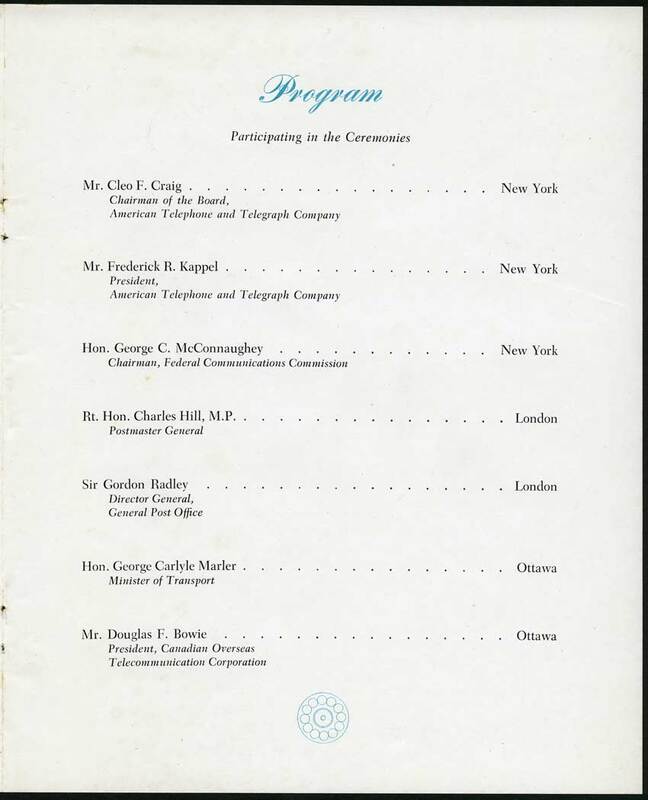 I’d like particularly to say to you, sir, how much we of the Bell System appreciate the fine contribution made by the Canadian Overseas Telecommunications Corporation and the government of Canada to this whole undertaking. (Marler) Thank you, Mr Craig. We in Canada have been glad to do our part in producing these happy results. (Craig) Won’t you have a few words now with Mr. McConnaughey; I’m sure he’d like to talk with you. (Marler) With pleasure. Goodbye, Mr Craig. (McConnaughey) Hello, Mr Marler, this is McConnaughey. I just wanted to greet you and sent your Ministry kindest regards, both personally and also officially from the Federal Communications Commission. (Marler) Well, it’s very good to talk to you this morning, Mr McConnaughey, and we appreciate your greeting and I return it most cordially to you and to all of your associates on the Commission. (McConnaughey) Thank you and goodbye, sir. (Craig) Dr Hill, are you with us again? This is Craig. (Hill) Yes, Mr Craig, and Mr Marler, I’ve been listening to you with great pleasure. 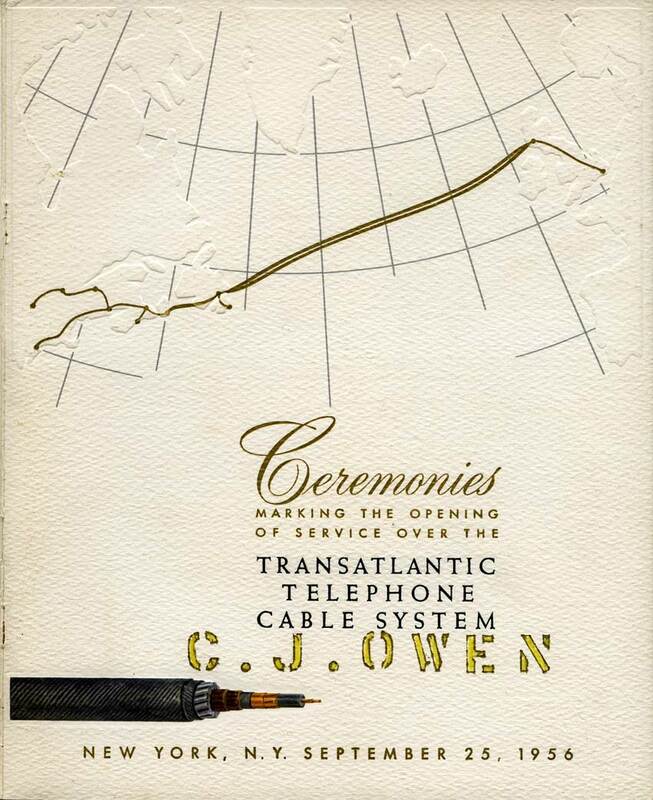 Now I believe the moment has come when we declare the first transatlantic telephone cable open for service. (Craig) Yes, Dr Hill. On behalf of the ATT and the Bell Telephone System, I wish to thank all of the men and women who by their efforts have created this new cable, and will maintain and operate it for public use. I now declare the cable open for service between the United States and the United Kingdom. 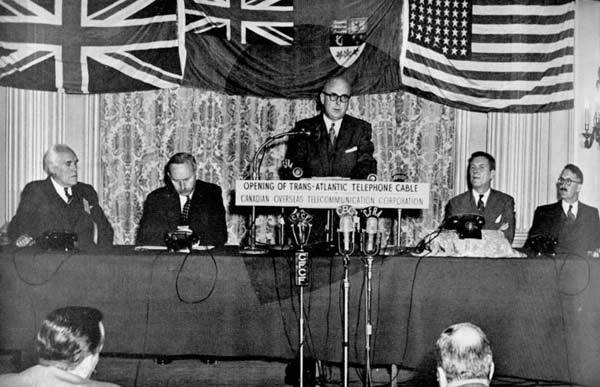 (Marler) On behalf of the COTC and the government, we in Canada also desire to join in thanking all who contributed to this splendid cable, and I declare it open for service between Canada and the United Kingdom. (Hill) We in the British Post Office join with you, Mr Craig, and with you, Mr Marler, in your expression of thanks to all concerned in this fine job, and I’ve great pleasure in declaring the cable open for service between the United Kingdom and the United States, and between the United Kingdom and Canada. 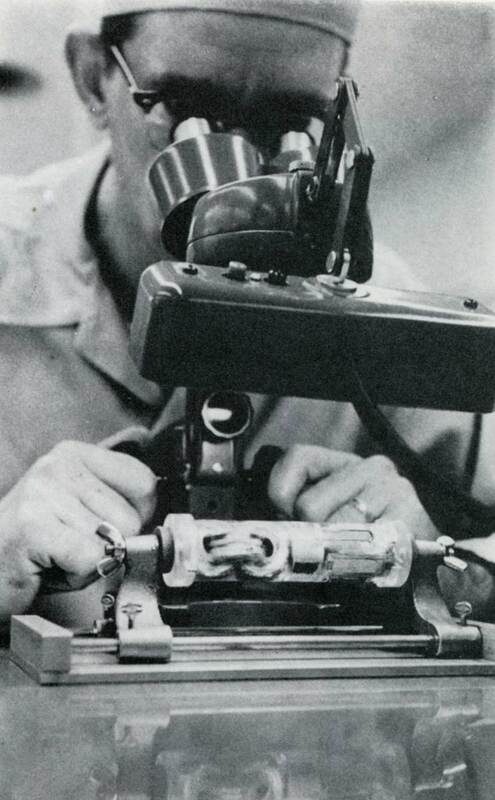 In January 1957 the Canadian Broadcasting Corporation (CBC) broadcast a television interview with COTC’s President, Douglas Bowie, who had participated in the TAT-1 opening ceremony just four months earlier. 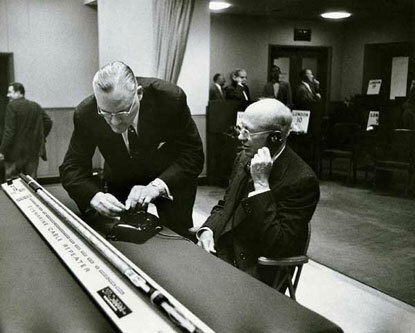 The interview included a demonstration of both telephone and telex calls on the new cable. Video of this interview may be viewed at the CBC archives website. Mr. Bowie noted that just one of the 36 telephone circuits could be used to provide 22 telegraph/Telex channels; this was the beginning of the end for transatlantic telegraph cables, all of which were withdrawn from service by the mid 1960s. The cost of a three-minute call between the USA and Britain was $12 during business hours, $9 on evenings and weekends. The US Bureau of Labor Statistics inflation calculator shows that $12 in 1956 would be the equivalent of $100 today. 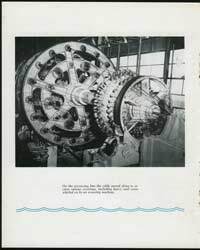 TAT-1 remained in service until 1978 without a single technical failure, and was withdrawn from service only because many higher-capacity cables had by then been installed across the Atlantic. 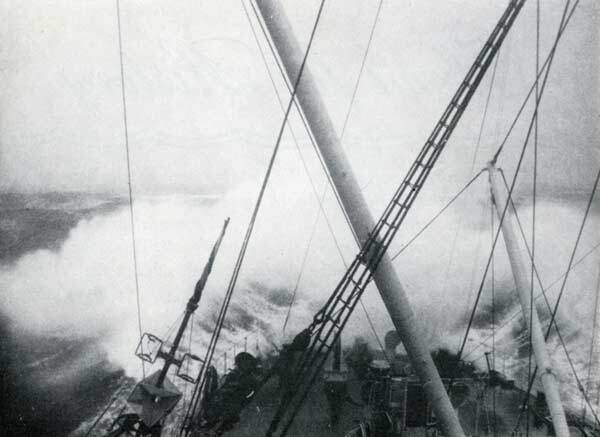 The only recorded fault was a three-day outage in the eastbound circuit in July 1959, caused by the cable being snagged and broken by a never-found fishing trawler in the relatively shallow water off the Scottish coast. 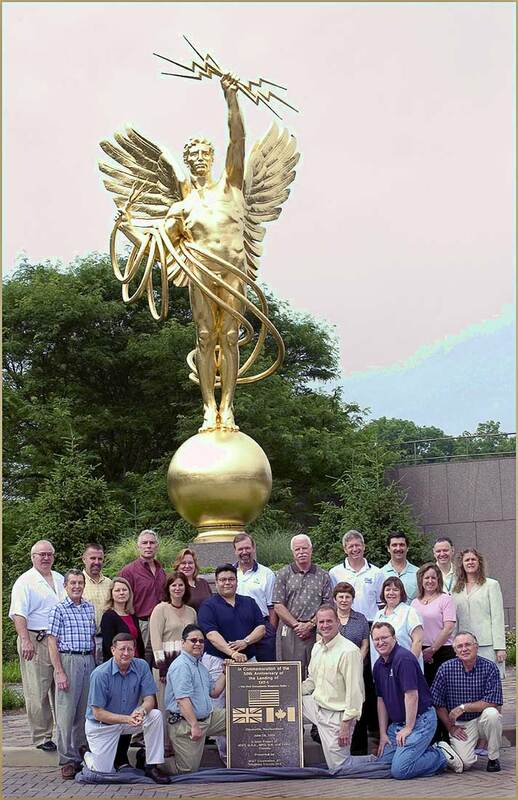 In 2006 the importance of TAT-1 was recognized by designation of the project as an IEEE Milestone in Electrical Engineering. Commemorative plaques were installed at 52 Cormack Dr., Clarenville, Newfoundland, Canada; at the Cape Breton Fossil Centre in Sydney Mines on Cape Breton Island, Canada; and in Gallanach Bay, about 3km south of Oban, Scotland. As of 2012 the Oban cable station is falling into ruin, as can be seen in the photos on the DerelictPlaces website.